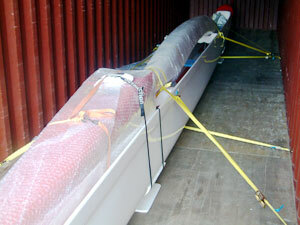 Due to the overseas interest and orders for the Mirage OC6 and the need to find a cheaper way to export the canoe overseas we developed Mirage OC6 canoes that can split into 2 and 3 pieces that easily fit into 20′ and 40′ shipping containers and reduce the freight costs. We have transported these Mirage OC6s as far away as Germany, South Africa, Japan, Hong Kong, Singapore, Cook Islands, Samoa, Fiji and New Zealand. 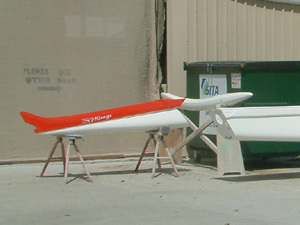 This 2 piece design was produced to reduce the shipping cost of exporting a full length 45′ Mirage. 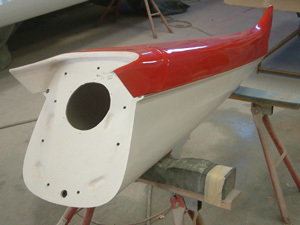 By designing a removable rear bulkhead the hull and all accessories could fit into a 40′ shipping container and dramatically reduce the shipping cost. 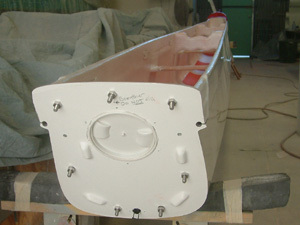 The 2 piece join has four different options of where the join can be placed either at the front bulkhead, first iako mount, second iako mount or at the rear bulkhead as pictured. And don’t forget our 2 piece folding Mirage.